There is a new version of this tutorial available for CentOS 7.6. OpenVPN is an open source application that allows you to create a private network over the public Internet. OpenVPN tunnels your network connection securely trough the internet. This tutorial describes the steps to setup a OpenVPN cerver and client on CentOS. Enable the epel-repository in CentOS. Install openvpn, easy-rsa and iptables. Setting up the OpenVPN client application. 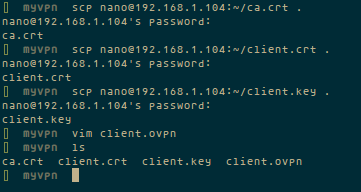 Step 1 - copy easy-rsa script generation to "/etc/openvpn/". Then go to the easy-rsa directory and edit the vars file. Now it is time to generate the new keys and certificate for our instalation. Then run clean-all to ensure that we have a clean certificate setup. 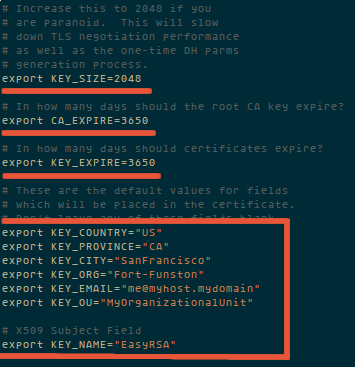 Now generate a certificate authority(ca). You will be asked about Country Name etc., enter your details. See screenshot below for my values. This command will create a file ca.crt and ca.key in the directory /etc/openvpn/easy-rsa/2.0/keys/. 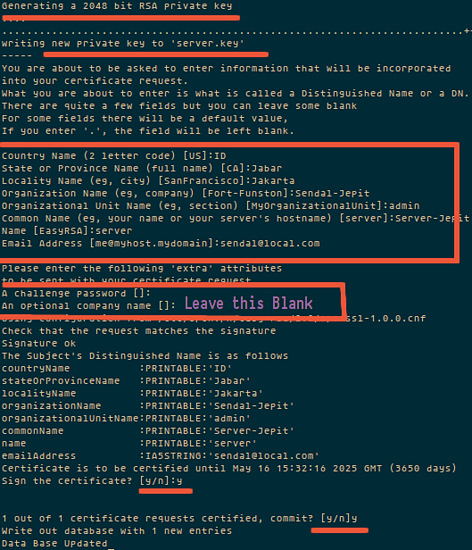 Step 2 - Now generate a server key and certificate. Step 3 - Build a Diffie-Hellman key exchange. please wait, it will take some time to generate the the files. The time depends on the KEY_SIZE you have the settings on the file vars. 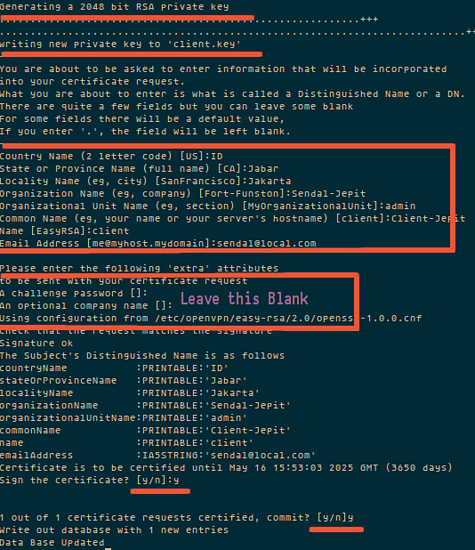 Step 4 - Generate client key and certificate. Step 5 - Move or copy the directory `keys/` to `/etc/opennvpn`. # "dev tun" will create a routed IP tunnel. Create a folder for the log file. Then reboot the server to apply the change. Step 2 - Add iptables-rule to forward a routing to our openvpn subnet. Step 3 - Enable port forwarding. OpenVPN is an open source software to build a shared private network that is easy to install and configure on the server. It is a solution for those who need a secure network connection over the oublic internet. Are you sure that the iptables setup is correct? It looks like you forward a single ip instead of all possible connected clients. With the current setup, clients connect but not allowed on the internet. IMPORTANT: change "eth0" to your ethernet device that your server connects to the internet (mine was venet0, where the real traffic comes through venet0:0). Please stop disabling selinux and start learning firewalld! Selinux provides useful security enhancements, especially interesting for a server which is exposed on the internet! Firewalld is the future, so you should accept that change, and stop using legacy tools. Nice try with firewalld Dirk. If you were simply to accept changes, you would (likely) never use Linux. Linux is all about choices really, one does not tell me the tool I have to use to do the job just because RedHat introduced it. I might switch from iptables to firewalld one day when I see benefits. Thank you Dirk.. I signed up for an account to make this comment, and found your already beat me to the punch. Firewalld, systems, and SELinux are really not that hard to figure out. Kinda agree with Dirk you really need to adapt the choices/direction centos/redhat is going. Thanks for the post. Can anybody suggest some usefull mobile OpenVPN client? I want config OpenVPN using cerificate of EJBCA. Feb 27 12:10:29 openvpn.hjsnetworks.net systemd: Failed to start OpenVPN Robust And Highly Flexible Tunneling Application On server. Feb 27 12:10:29 openvpn.hjsnetworks.net systemd: Unit [email protected] entered failed state. Feb 27 12:10:29 openvpn.hjsnetworks.net systemd: [email protected] failed. how did you solve the [email protected] failed? should be dh2018.pem I believe. great article untill you said disable SELinux ..... dont disable it, figure it out, and use it correctly.. or youll just have more problems..
when you add iptable forward rules, use "iptables -t nat -A POSTROUTING -s 192.168.200.0/24 -o eth0 -j MASQUERADE"
"iptables -t nat -A POSTROUTING -s 192.168.200.024 -o eth0 -j MASQUERADE"
Or in my case, I had to substitute my NIC name instead of eth0. Make sure to get the results of ifconfig before entering the device. Right at the start of the document? So many small errors... Really need to fix this article. Especially the missing / in the iptables line. Why jump through a million hoops? Just download the official package from openvpn and yum install it. Voila. Everything is installed, configured and working out of the box. 2 commands. wget, rpm. All done. Takes 20 seconds. Can someone help me to understand how to determine my openvpn subnet that I set the route to? Hi and Thanks for helping me , can i set Signed Certificate instead easy rsa and create profile after set Signed Valid Certificate? also i want authentication with Radius , can you help me please?? I have 2 NAT vps from 2 different provider. both vps for vpn only. 1 is working well,connect but other one is showing this error in client device while trying to connect. Both on centos 7 and both server is configured exactly same. Thank you for this great document. I have complated the tuttorial. Everything looks okay but i am having "connection timeout" error while connecting to my VPN. I used port 443 (SSH) to prevent blocked ports on some routers(companies, schools, etc.). I am receiving packages from outside of my server on port 443. [email protected] is running OK without error. I have checked too many thing but i do not know what i am missing. Could you please help me to solve my problem? [[email protected] openvpn]# systemctl start [email protected] for [email protected] failed because the control process exited with error code. See "systemctl status [email protected]" and "journalctl -xe" for details. You should never disable selinux. This is very bad practice and I also don't really know why you are masking firewalld as that's a perfectly fine firewall and the default for centos.